Katharina Schmidt lives and works between Marseille and Berlin, since 2004. 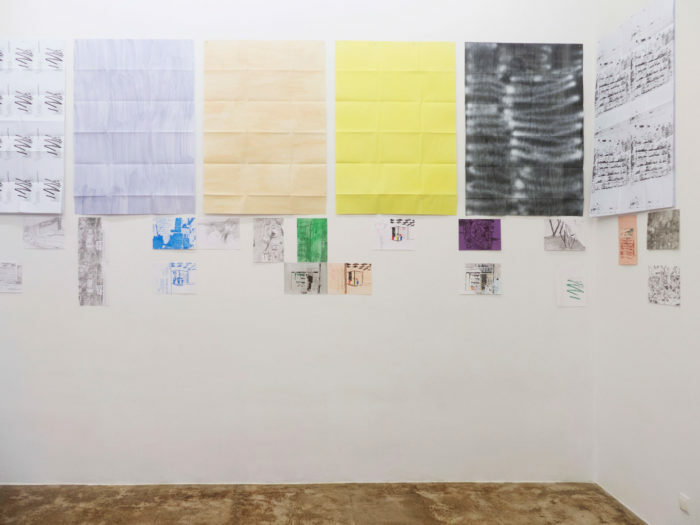 Using drawing, painting and art installation, she investigates the interconnectedness of common structures. Notions such as regularity, planification, the grid or the weft are counterbalanced with hazard, difference, divergence and error. This relation is explored in its relation with the possibilities and constraints of the different mediums in question. 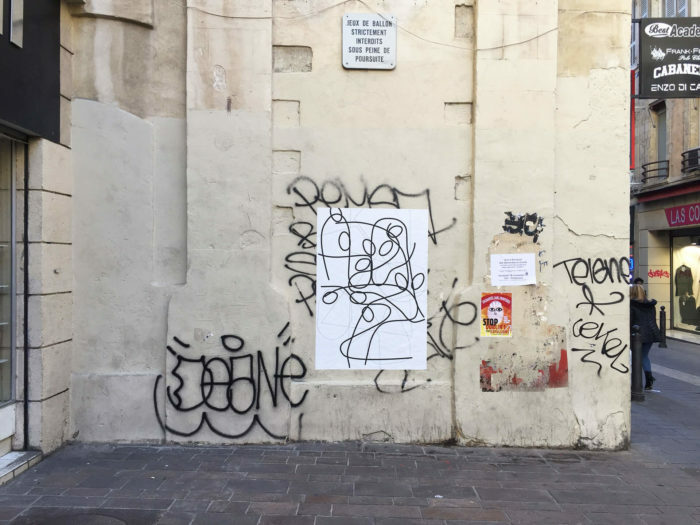 Taking as a starting point the analysis of a given territory – a city, a street, a building, or a space – the artist moves throughout different figurative concrete and abstract representations. Simultaneously, her works can exist in an autonomous or composed body that she explores. In accordance with several procedures, they can be retraced, enlarged, screened, printed, and reappear in different forms: books, dresses, curtains, wallpapers and murals. Since the beginning of her artistic career, Katharina Schmidt has been interested in the potential of collectively produced works. Thus, she collaborates with Stadt im Regal, a collective of artists. Since 1997, the latter designs exhibitions and projects on urbanism, urban planning and architecture. 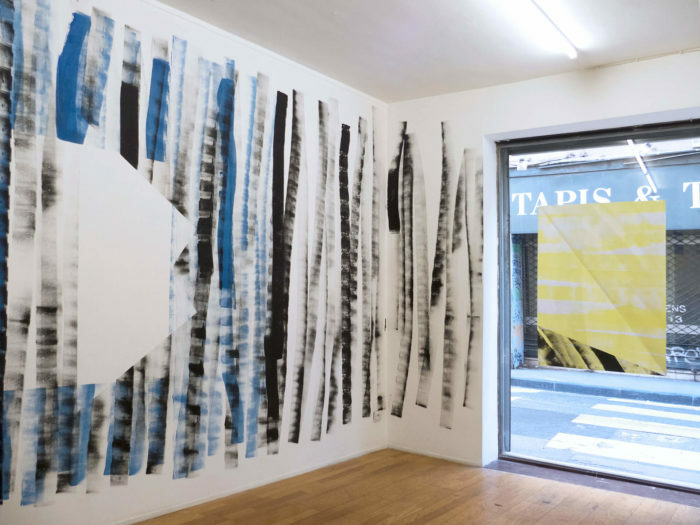 Between 2004 and 2016, Katharin Schmidt works as an art professor, teaching painting at l’Institut Supérieur d’Art of Toulouse. From 2013 to 2016, she leads a research project entitled genre2030, with the art historian Herve Senant. This project is about the possibilities of enlarging the movement of painting as a notion, and its consequences on exhibitions format and reciprocity. Instability, disturbance –notions that are voluntarily borrowed from gender studies, and transferred to the field of painting seem to be tools that enable a different conception of the exhibition. 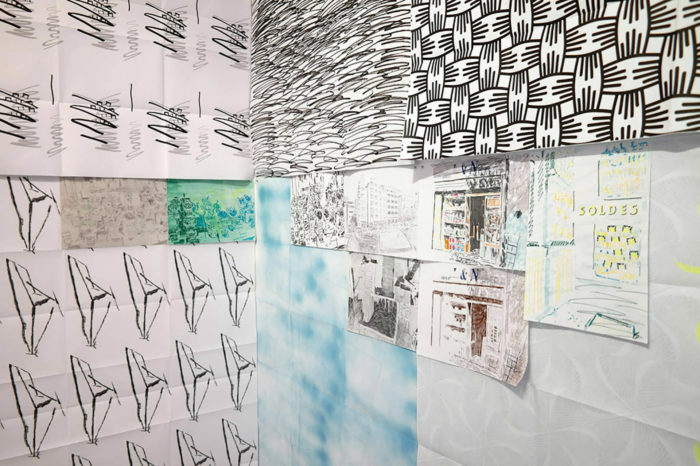 From 2008 to 2012, she works on the research project peinture2020malerei, in cooperation with Winfried Virnich, artist and professor at the Kunsthochschule Mainz. Since 2016, Katharina Schmidt is professor of painting at l’école supérieure d’art et de design Marseille-Méditerranée. She regularly exhibits her works in different international contexts. Katharina Schmidt, "Plan nach 10-194", affichage dans espace publique, Marseille 2017. Sérigraphie 105 x 150 cm, 2011. Katharina Schmidt, "Belsunce#Beuselstrasse", photo de l’installation, Galerie M+R Fricke", Berlin 2017. Tirages numériques, techniques mixtes 84 x1 18,9 cm et dessins techniques mixtes, 21 x 29,7 cm, 2013-2017. 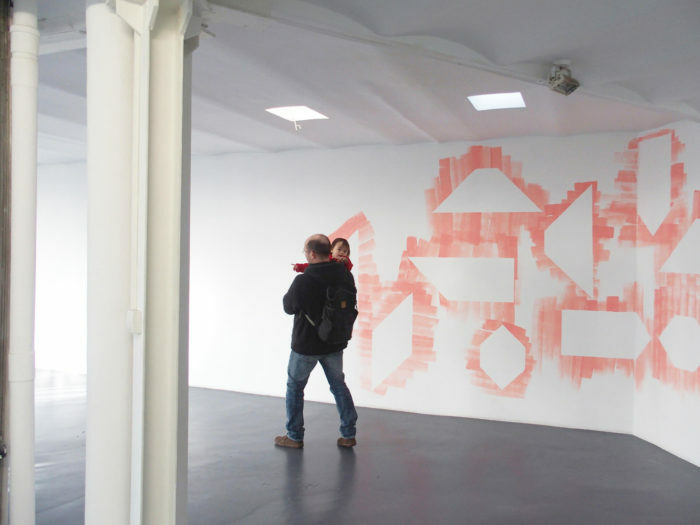 Katharina Schmidt, "Belsunce", détail de l’installation, Le Cube, Rabat, 2015. Tirages numériques, techniques mixtes 84 x 118,9 cm et dessins techniques mixtes, 21 x 29,7 cm, 2013-2015. Peinture murale et affiche (détail), Galerie du Tableau, 2017. Katharina Schmidt, "acht-zehn-zwanzig", peinture murale (détail), art cade - galerie de grand bain douche, Marseille 2018.